The Federation Drought ended with a La Nina in the early 1900s, perhaps the early 2020s could be similar. Enso itself has only been known as a phenomenon over the last century, first identified by Walker and Bjerknes in the 1920's as a periodic oscillation and then only dubbed the Southern Oscillation in the 1960's with the Walker Circulation identified by Bijerknes. So a mere 50 years or so of identifying and measuring this phenomenon, and maybe 30 years of suspect accurate measurement of it. Still no idea at all of it's drivers and a still poor understanding of what it's multiple effects are globally, Modoki, strong , weak Nina/Nino etc. Even with all our current tech, we are still unable to overcome the predictability barrier with any real skill , IE: We don't know till it happens. All that aside, we are asked to believe that those in the know can predict what will happen in a hundred years from now based on some GIGO models that they created with some spliced proxy historical temperature records and some modern instrument ones to predict the future? Some might argue that this sort of thing is necessary in order to "Model" the predicted outcome, that we need such exercises in order to understand what will happen etc. My question is, How do you accurately "model" a chaotic system which has no known driver for now ? Enso might well be a known phenomenon, and might well be measured, but... How do you model it accurately without knowing it's drivers ? You might not know the drivers, but others do. Chaotic system does not mean hard to model. In fact chaos can be demonstrated in very simple models, the simplest i know of being iterating the formula rx(1-x). Chaos means that very close solutions tend to diverge. So if the difference between model and actual is less than 1% at start it might grow to 25% after a short time, and 300% at a long time. The normal method of dealing with this is to run multiple models. When the models predict different things then the result is not predictable. When the different models predict the same thing the result is predictable. Sea level pressure patterns show strong ridging all through Australia and Pacific (and even through the NZ region), which is tending to strengthen the trade winds. The westerly activity is being driven from the NH where significant low pressure anomalies evident through much of tropical Pacific. I cannot recall seeing anything other than high pressure anomalies in the SE Pacific for any length of time in at least the last 5 or so years. Agree, climate models have been wrong for decades - yet excuses are made. I too believe that a process needs to be fully understood before it can be modeled. And how do you define wrong. If you define wrong as not perfect, then yes the models have been wrong. Otherwise, the question then is whether there is a better way to predict the climate than using the models? I think a good definition of 'wrong' is to consider the spread of different model predictions, and whether the actual result is within that spread or not. By that standard the ENSO forecasts have been correct most of the time, with 2015 (no not the failed el nino of 2014, but failure to predict the extremity of 15/16) and last year being the two significant failures. Any model that has been used for the climate predictions documented over the past 30 years. Remember, no snow, dams dry, beach fronts innundated? I do not know of any model prediction of no snow or dams dry or beach fronts inundated that has not proven accurate. From the data I have seen climate models appear to be pretty much on the mark. Sure, sometimes they don't show what we'd like them to show - but that is very different to being wrong. I'd also suggest that modelling a process can be very much a part of understanding it. I'd also suggest that the modelling of a process such as this one goes hand in hand with working with scientists who are looking in from a very different perspective, and likewise use feedback from what is being already observed - hindcasting - to further improve the models. Asking for perfection from a model is never going to happen - but what we have now is as good as there is available, and to ignore until we reach a point of perfection, is a potentially dangerous approach. "Strong indications that there will be a major shift in the tropical intraseasonal + seasonal state via the ECMWF Monthly model. 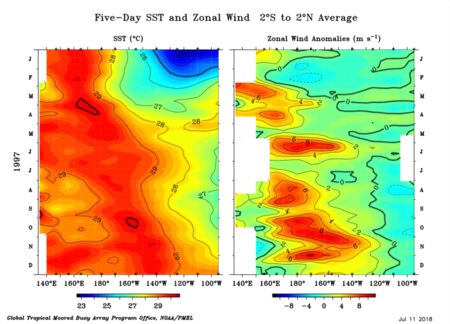 This is the emergence of an El Nino atmospheric standing wave, meaning the atmosphere is forecast to couple to El Nino conditions in the Pacific.The El Nino atmospheric standing wave emerges following the passage of the convectively active phase of the Madden Julian Oscillation across the Pacific." Roughly 3 or 4 months in the middle of 2017 were wrong. What about the other 9 years and 9 months for the last decade? Seems to have the sinking region in the Indian Ocean instead of over Australia which might leave Australia in a more neutral pattern. If I understand the chart correctly. We will see how MV's prediction comes to play very soon then, .....after this present phase 5/6 MJO dissipates? I remember previous discussions where we seemed to wait for months to get the ocean and atmosphere to couple - will be a lot quicker for this event if it comes off as forecast. Doesn't the atmospheric coupling require warmer water hitting the surface at the equator in the eastern regions, disrupting the normal upwelling from cooler currents off the coast of South America and thus changing the positioning of the Hadley cells along the equatorial Pacific? i.e. I would always expect the atmospheric coupling to be the last piece of the puzzle to fall into place in the ENSO relationship. Or is this a bit too simplistic? (c) is your rating based on your own assessment or some scientific re-analysis? Because my anecdotal memory is that it was fairly hit and miss across that time period - as CF says "a broken clock is still right 2x a day"
I think if someone knew the answer to that question you best write a paper asap as that may solve ENSO once and for all. After all, didn't last season suggest that one doesn't necessarily lead the other? That was not the last forecast of the models. A broken clock is stuck in the past and can't move on. Seems like the model critics are stuck on the failed forecasts from Autumn last year and ignored the successful forecasts that have occurred since then. The models are not perfect. What is a better alternative? 2017 50/50 warm neutral or el nino - actually borderline cool neutral/la nina. 2015 Models forecast weak to moderate el nino, while some speculated that the 14/15 warm event should be followed by cool. Result near record el nino. This forecast was actcually worse than the often criticised 2014 forecast, as the model average stayed in weak el nino territory until well after the predictability period. 2014 models forecast weak el nino. Result borderline warm neutral/weak el nino. Previously criticised as a model failure, but the highest multi-model average forecast was 1.2, and speculation of an extreme el nino was not driven by model forecast, but by the size of the kelvin wave. 2012 models forecast warm/neutral/weak el nino. Result warm neutral in Spring, but collapsed late in the year. Not exactly peer reviewed rigorous analysis, but a lot more rigorous than anything you have provided on model performance. 1997/1998 was in my mind the perfect el nino and I think is a good illustration of some processes that are also apparent in other years, but not as clearly. The Pacific is primed for a possible el nino with weak warm anomalies in the far west in January. 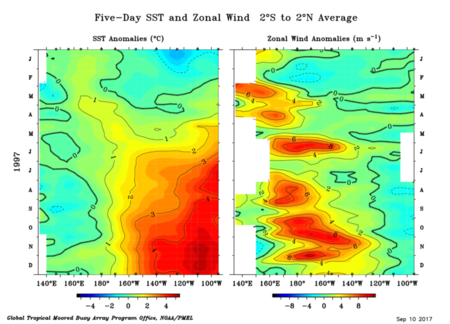 In March and April very strong westerly activity in the far west initiates potential el nino development. This causes two things to happen. 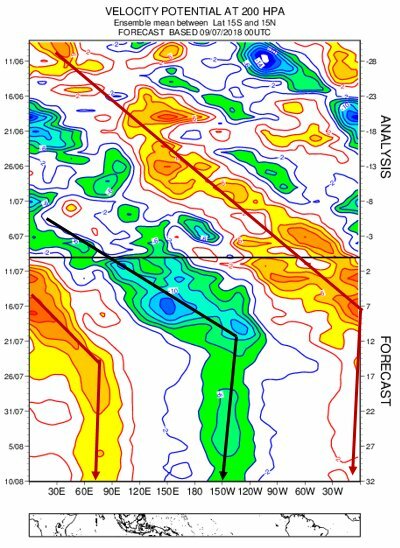 First a very strong kelvin wave (visible in subsurface, not shown) crosses the Pacific to initiate surface warming from May in the far east. Secondly more local effects, primarily changes in currents and reduced evaporation act to intensify the western warm pool and push it further east. In late May/early June a further extreme WWB occurs, at the same time as the eastern warming and eastern warming join up, and el nino is pretty much locked in at that point. Looking at actual temperatures and not anomalies illustrates an important point - the primary westerly activity is following the very warm water. Deep tropical convection likes very warm water (tropical cyclone activity starts at roughly 27 C if other conditions are favourable). While the strongest anomalies are in the east, it is the warm anomalies in the central Pacific that are far enough above 27 to drive significant tropical convection and resulting westerly activity. The far east actually has weak easterly anomalies. IMO we just cant model how these factors will portray in anything but circa a month ahead. Each measure above is modelled (seemingly separately in my observance), but the models for each are rarely accurate (converge) for predictions outside say, a month ahead? But we are all getting better (and I do agree), the models will improve - but only with more understanding of the drivers than what "we" presently program into the models IMO. Generated in 0.041 seconds in which 0.027 seconds were spent on a total of 14 queries. Zlib compression disabled.